Duane Syndrome (DS) in its classic form is characterized by congenital onset limitation of horizontal eye movements with globe retraction and narrowing of palpebral fissure (PF) on adduction. Despite significant limitation of horizontal ocular motility, the ocular deviation in primary position is lesser than would occur in muscle palsies. Upshoot or downshoot in adduction is commonly associated. A congenital sixth nerve or congenital lateral rectus (LR) palsy is rare and may be related to birth trauma. The title of a Souza-Dias publication stated: "Congenital VIth nerve is Duane's Syndrome until disproven", and it also reflects the rarity of congenital sixth nerve paresis. , Here, we present a case of an adolescent, with a congenital sixth nerve palsy presenting as Type I DS. To our knowledge, a similar case has not been reported in literature (Medline search). Our patient was successfully managed with a single muscle surgery. A 13-year-old girl presented to us with convergent strabismus in right eye (RE) since birth. Ante, peri and postnatal history were normal. There was no history of trauma or prior treatment for the strabismus. Old family photographs showed right esotropia (RET). The general and systemic examinations were essentially normal. Ocular examination revealed a visual acuity of 3/60 and N 36 in right eye which was not improving. Visual acuity in left eye was 6/6 and N 6. Refraction revealed +2 D of against the rule (ATR) HM astigmatism in RE. Prism cover test revealed an RET of 70 PD with a narrow PF RE in primary position. There was marked limitation of abduction of RE with widening of the PF on abduction. Adduction of RE was slightly limited with upshoot and further narrowing of PF. The esotropia had a "V" pattern of 20 PD. There was no compensatory head posture [Figure 1]. There were no binocular functions on Worth Four Dot and Randot Stereo acuity Tests. Forced duction testing revealed a tight medial rectus RE. The patient underwent 5 mm recession of right medial rectus (MR) by conjunctival limbal approach and standard technique. A very tight MR muscle was encountered intraoperatively with thin blue sclera under MR muscle. The patient was followed up on day 1, 7, 14 and 60 postoperatively. Postoperative examinations revealed RET of 10 PD in primary position. Ocular movements showed no change in abduction. Compared to preoperative adduction movement, a greater decrease in RE was noted. The abnormality in PF size in different gazes including the primary position had reduced markedly. The residual V pattern was of 12 PD. 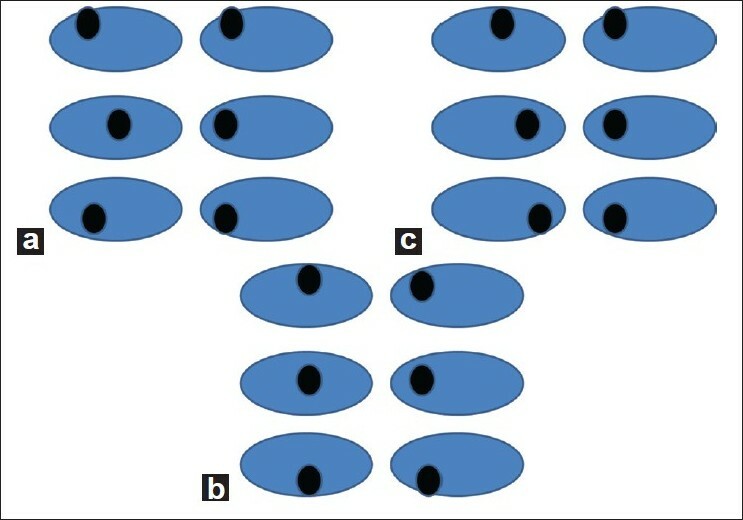 The patient was satisfied with the cosmesis [Figure 2] and [Figure 3]. Infantile esotropia also forms a differential diagnosis of this presentation, but it usually has full ductions. A diagnosis of congenital LR palsy with tight MR was made on the basis of the above features. The collapse of V pattern can be attributed to correction of deviation in primary position. A V pattern of up to 15 PD (residual V of 12 PD in our patient) is considered physiological. On further retrospection, correction of such a large esodeviation in DS would have required a more aggressive surgery like asymmetric MR recessions or transpositions of the SR/IR muscles temporally. ,,, We could have probably avoided the postoperative adduction deficit in MR by reducing the amount of MR recession or by putting the tight muscle on hang back sutures. 1. von Noorden GK, Campos EC. Special Forms of Strabismus. In: von Noorden GK, Campos EC, editors. Binocular Vision and Ocular Motility. 6 th ed. St. Louis: Mosby; 1990. p. 459-65. 2. Moster ML. Paresis of isolated and multiple cranial nerves and painful ophthalmoplegia. In: Yanoff M, Duker JS, editors. Ophthalmology. 2 nd ed. St. Louis: Mosby; 2004. p. 1324. 3. Jampolsky A. Duane Syndrome. In: Rosenbaum AL, Santiago AP, editors. Clinical Strabismus Management. United States: W. B. Saunders Company; 1999. p. 325-34. 4. Souza-Dias C. Congenital VI nerve palsy is Duane's syndrome until disproven. Binocul Vis Q 1992;7:70. 5. Huber A. Electrophysiology of the retraction syndrome. Br J Ophthalmol 1974;58:293. 6. von Noorden GK, Campos EC. Principles of Surgical Treatment. In: von Noorden GK, Campos EC, editors. Binocular Vision and Ocular Motility. 6 th ed. St. Louis: Mosby; 1990. p. 583-8. 7. Am J Ophthalmol 1997:91:1. 197. Wong G. Jampolsky A. Scott AB: Primary position deviation in Duane's syndrome. MCV Q 1972:8:302. 198. 8. Jampolsky A. A functional classification of retraction syndromes. The 19 th Jules Stein Lecture, Jules Stein Eye Institute, University of California at Los Angeles, April 22, 1988. Audio Digest Ophthalmol 1988;26:19S. 9. Collins CC, Jampolsky A, Howe PS. The unique medial rectus characteristics in Duane's Syndrome. In: Prieto-Diaz J, editor. XIIth Congress of the Latin American Council of Strabismus, Annex Smith-Kettlewell Oculomotor Symposium. Buenos Aires, Argentina: Graphic Lifra; 1996. p. 569. 10. Knapp P. Vertically incomitant horizontal strabismus: The so called "A" and "V" syndrome. Trans Am Ophthalmol Soc 1959;57:666-99. 11. Jampolsky A. When is supramaximal surgery safe? Am Orthopt J 1987;37:33. 12. Laby DM, Rosenbaum AL. Adjustable vertical rectus muscle transposition surgery. J Pediatr Ophthalmol Strabismus 1994;31:75-8. 13. Miller JM, Demer JL, Rosenbaum AL. Effect of transposition surgery on rectus muscle paths by magnetic resonance imaging. Ophthalmology 1993;100:475-87. 14. Molarte AB, Rosenbaum AL. Vertical rectus muscle transposition for Duane's syndrome. J Pediatr Ophthalmol Strabismus 1990;27:171-7.